I have to say I was really impressed at the size of this collection, 25 short stories, you are definitely getting your moneys worth. 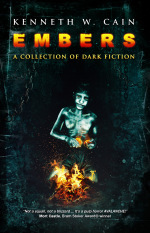 I first discovered Embers by Kenneth W.Cain as I'm a really big fan of Crystal Lake Publishing. Previously they have release some great horror short story anthologies such as Gutted which contains stories from Neil Gaiman, Clive Barker, Ramsey Campbell and Kevin Lucia. Crystal Lake have also released some really great original novels such as Pretty Little Dead Girls by Mercedes M.Yardley. They have also branched out into non-fiction with horror writing guides which have been incredibly helpful over the years. So when I saw this I was eager to take a look. Looking at the beginning pages it is clear this is no novice writer he's had countless other things published in various genres. The first tale, The Chamber, was just so dark and chilling I knew this would be a great read. A very strong story to open the collection with. 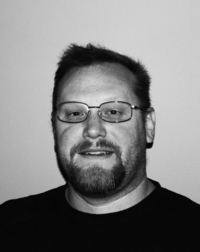 What makes his work scary is that he takes normal everyday situations with characters just like you and me and twists them into something horrific. These are tales that really could happen to anyone. There is a lot of depth to these tales, such as Final Breath, there's an extraordinary range of genres and topics used, some are like love stories with a dark twist, some are psychological, some are gory, there's plenty of monsters thrown in as well as those less known. Some are just downright scary and there's some very clever takes on familiar tropes. These are tales that will scare everyone, they're not all about monsters but some of the more real life down to earth horrors we will all face, such as loss of a loved one, beginning your life again, falling in love with the wrong person. As there are 25 stories I'll just highlight my favourite ones. Valerie's Window - A really dark sinister tale amplified from the perspective of the young naive girl, Valerie. A window to dream by - I just thought this was a really clever tale, particularly with the connection of the homeless guys who watch Seth looking up into the sky. It's only right until the end where you get the whole hit of the story and it's a great ending. Closer - Travis goes hunting with his estranged father in a bid to win his approval but he's never been able to pull the trigger. Killing just isn't in his nature. Breathing Cave - Kelly goes on a trip with her new boyfriend and his friends. They pass a cave, Kelly doesn't want to enter but doesn't want to lose face in front of her new friends. Blackbird's Breath - Henry is trying to come to terms with his loss until a blackbird gets stuck behind his fireplace.